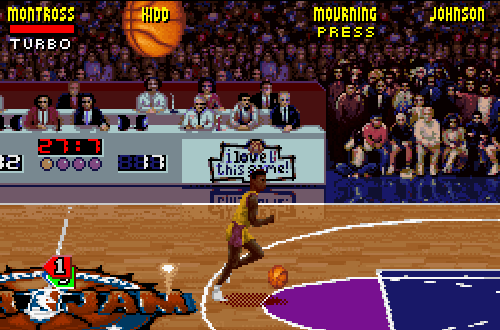 While NBA Jam Tournament Edition is one of my all-time favourite games, it does have its flaws. I’ve noted that there were some unusual ratings (and possibly a reason for that), but there were also issues with player appearances. Now, obviously the tech wasn’t as sophisticated back then and the game wasn’t aiming for realism anyway, but a few player likenesses – such as they were – definitely weren’t right. One of the most prominent examples was 1995 Co-Rookie of the Year, Jason Kidd. Looking at the above screenshot from the Super Nintendo version of NBA Jam TE, you’ll see what I’m talking about: Kidd has dark skin, and is also taller than he should be. This is a particularly egregious error on both counts. Kidd is actually biracial as his father is African-American and his mother is white and of Irish descent, and in all fairness, you wouldn’t say that he has a very pale complexion. Still, NBA Jam TE clearly picked the wrong skin tone and player model. If you happened to become a fan of the NBA through playing the game, you’d probably be very surprised when you saw the real Jason Kidd! Interestingly, a few games from the mid 90s made similar errors, likely due to a lack of variation in skin textures. None were as wide of the mark as NBA Jam TE, though, and they also all had him at his correct height. That wouldn’t be the last time that a video game would mess up a player’s appearance by assigning them the wrong face and skin tone. 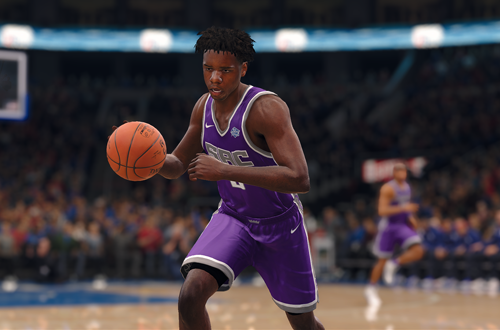 In fact, it happened very recently, as Bogdan Bogdanovic’s appearance in NBA Live 18 remained inaccurate through quite a few roster and content updates. As shown in the above screenshot, his original face bore no resemblance to him at all. It stands out a lot more than an incorrect sprite in NBA Jam Tournament Edition, and is a much bigger mistake given that players these days actually get their faces scanned into the games. You certainly wouldn’t expect to see an inaccuracy like that on the current generation, but it happened. Of course, not every player sits for a face scan for NBA Live or NBA 2K. Since it’s not compulsory, players can elect not to have their faces scanned, though I’d suggest it’s a rare individual who declines to do so. Generally speaking, if a player doesn’t sit for a face scan, it’s because they weren’t around when the developers from EA Sports or Visual Concepts are performing a bulk of the scans for the upcoming games, and so hasn’t had an opportunity yet. In that instance, a face will be made the old-fashioned way, with varying results and likely a few generic placeholders on standby. Clearly the wrong face was assigned on this occasion, lasting through too many updates. I did want to avoid filling this list with player faces that simply looked off, as I felt it would be more interesting to focus on particularly unusual mistakes. However, I can’t go past Larry Bird’s face in NBA 2K18. Simply put, it’s comically bad. The funniest remark I’ve seen about it is that it looks like they brought in a random middle-aged plumber with a vague resemblance to Larry Legend to sit for a face scan. The quality of the historical player faces has suffered this generation because they do stand out against current players; after all, the current players can be scanned, but the former players wouldn’t accurately resemble their younger selves (and some are deceased). 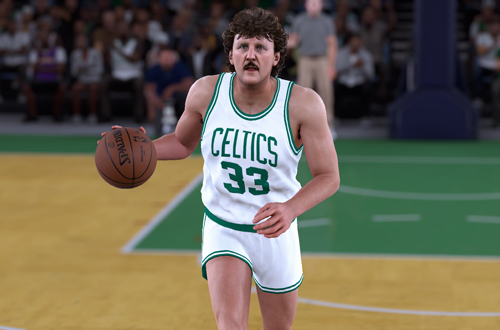 Even so, Larry Bird’s face in NBA 2K18 stands out; not just because it’s especially bad, but because he had a much better face in NBA 2K17. It arguably wasn’t one of the best historical player faces, but it was at least a very respectable likeness. If it was going to be replaced, it should’ve been by a superior version and not that atrocity. It’s really puzzling that that happened; that someone looked at the two faces and decided “Yep, the new one is definitely better”. Fortunately, Bird received another new face in NBA 2K19, and it’s a much better likeness. Still, it’s really weird what happened last year, especially with the Legends being spotlighted further in the All-Time squads. Let’s flash back to another older release. As I said in last week’s Friday Five, the prior gen version of NBA Live 07 was not the top priority, and although the team did try to still make it a good product, it was riddled with issues. Problems with gameplay and disappointment with game modes were at the top of the list, but it was also noted that Renaldo Balkman, then a rookie with the New York Knicks, was missing a face. This left him with a generic headshape, wrapped in the colourful placeholder texture that you can see in the screenshot above. Again, it wasn’t the biggest problem with NBA Live 07, but we noticed it fairly quickly upon playing with or against the Knicks. Fortunately, it was an issue that was addressed by the game’s official patch. It was also something that we could fix ourselves in the short term, since we had plenty of people making mods for NBA Live 07 PC. While you might think that this is another time that the consoles of yesteryear were left out in the cold, I fired up the PlayStation 2 version of NBA Live 07 and Balkman does have a face, so it seems this oversight only affected the PC version. That’s interesting as the PC version was ported from the PS2, though there are some differences in the file archives. At the end of the day, it’s another example of how NBA Live 07 was a troubled release in a lot of ways. 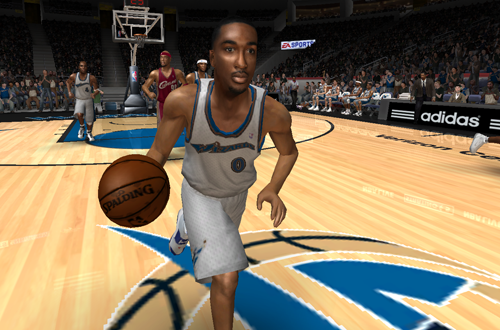 The prior gen version of NBA Live 08 was an even sloppier product than NBA Live 07, marking a disappointing end to the series’ run on PC to date. This one is a little more subtle than the other goofs with player appearances, but it’s still noticeable. If you look at Gilbert Arenas, the skin tone of his arms and legs doesn’t quite match up with his face, being a little too light. It’s more apparent under certain lighting, but once you see it, it’s difficult to ignore. 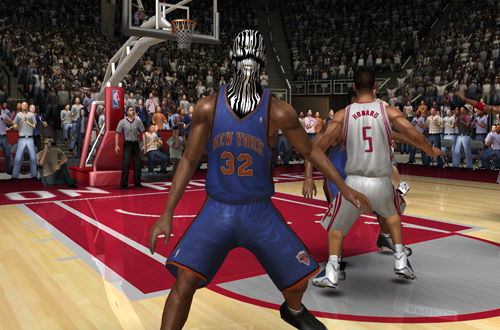 I’d suggest that it’s the result of NBA Live 08’s limited selection of generic skin textures. Had Arenas been given his own custom arm and leg textures, or assigned one of the other skin tones, he would’ve looked better. Subtle though this issue may be compared to the other examples, this one stands out because Gilbert Arenas was the cover player of NBA Live 08. If there’s ever a player whose appearance you want to get right, it’s the guy who’s appearing on the cover of your game! He also has a very low clutch rating in the PC version, so suffice to say he didn’t get a lot of respect despite being the face of NBA Live 08. Agent Zero does look fine in the Xbox 360/PlayStation 3 version and has better clutch abilities (he hits a gamewinning shot in the attract mode video, after all), so again, it underscores how much of an afterthought the prior gen version was following NBA Live 06. Can you think of any other examples where a basketball video game really messed up on a certain player’s appearance? Let me know in the comments, and as always, feel free to take the discussion to the NLSC Forum! That’s all for this week, so thanks for checking in, have a great weekend, and please join me again next Friday for another Five. Come to think of it, Spider-Man 3 came out in April 2007, while NBA Live 07 PC was released in October 2006. Early promotion, indeed!